Cartridge Save has a mission to save you money and time on ink for HP 920-cxi printers. Unavoidably your HP 920cxi will use all of your printer ink, and when it does you'll soon realise that brand new HP 920cxi ink is often quite pricey. Thank goodness you do not need to be anxious about dishing out the steep prices you'll find on the high street because now at Cartridge Save you can pick up all the HP 920 cxi cartridges you'll ever need at seriously low prices. Start saving cash on your ink by purchasing with Cartridge Save! There's no reason why you should fork out so much on the 920-cxi original cartridge or 920cxi compatible ink in the main street when you can easily save a handful of money shopping online with Cartridge Save. You have utter peace of mind when you buy your DeskJet 920cxi ink cartridges from us because every one is covered by a no quibbles money back guarantee. Remember that every purchase also has free delivery, typically arriving on your doorstep the next working day! Combining a compact design with high quality photo output, the HP Deskjet 920cxi is a good choice for users seeking a personal inkjet printer for their basic printing needs. The printer is part of the Deskjet 920c series, so it shares similar features with other printers from the same line. Good enough for very light printing requirements, the HP Deskjet 920cxi runs on a 2MB RAM (not expandable) and has a monthly duty cycle of about 1,000 pages per month. It works fastest with a USB cord, but it can also be connected to the computer via a parallel cord. The printer is 7.72 inches tall and 14.6 inches deep. The compact frame's centrepiece is the 100-sheet tray, which can be folded when not in use. Easy to set up and use, the HP Deskjet 920cxi boasts a plug-and-play function. The drop-on demand thermal inkjet technology promises lower costs per page. The printer is quite light at 5.85 Kilograms and consumes less energy. It is surprisingly quiet, too, emitting 46 dBA of noise when in use. 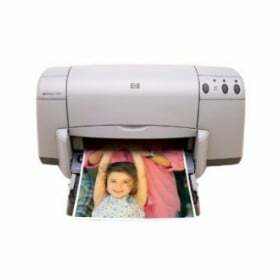 Photo prints can be enhanced with the HP PhotoREt III technology, which also contributes to less ink consumption. The print speed of the HP Deskjet 920cxi remains inferior; at 'normal' mode, it can only produce 5.2 ppm in black and 0.7 ppm in colour. When compared to similarly priced inkjet printers from other brands, the HP Deskjet 920cxi is very slow.